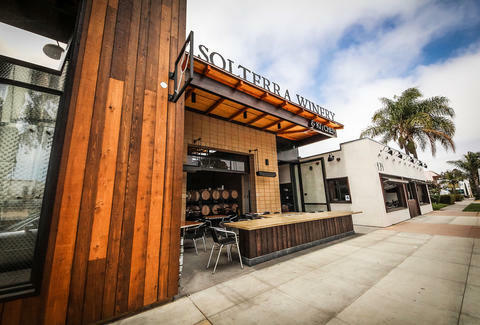 Gone are the days of having to journey into the countryside for a little swish and spit (well, the classy version; technically you can do that anywhere) -- Leucadia now has an urban winery right on the 101: Solterra Winery and Kitchen, offering everything from wine tastings and bottles to-go, to an all-you-can-eat Mediterranean tapas buffet. 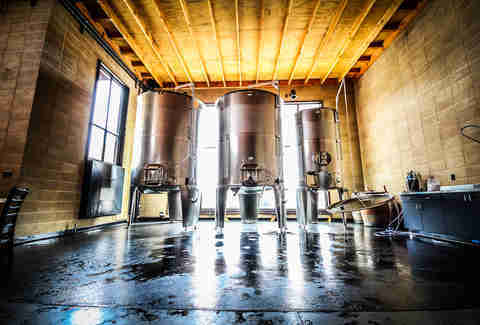 Stainless steel tanks are ready and waiting for wine-making to officially begin in the 3000sqft barrel room. 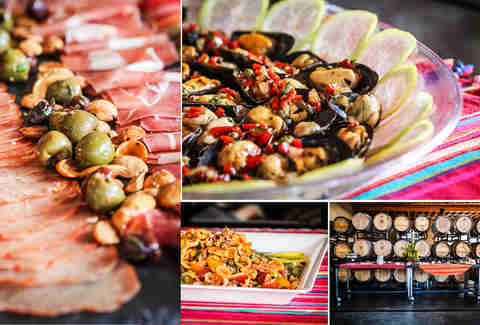 They hope to have production in full swing with the next grape harvest in the Fall, eventually having all of their 20+ wine varieties produced on-site. 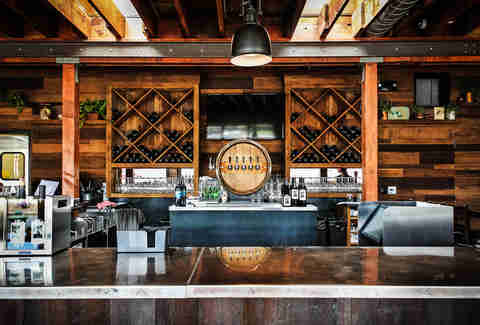 The patio out front has a pit for fireside drinking and opens up into the barrel room where you can dine amongst more than 100 wooden wine barrels and listen to live music nightly. Demand that whoever is playing sing "Red Red Wine". Everyone will find it hilarious. Sit at the bar for wine-tasting and sample six of their wines at a time, or stick to a single selection by the glass, bottle, or get an entire growler of wine on tap. 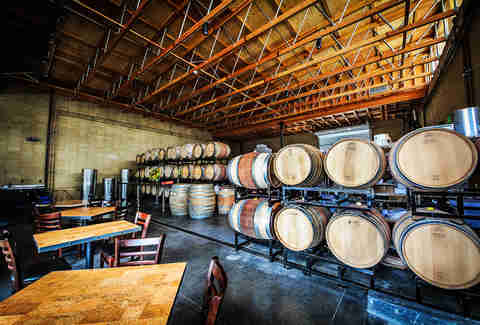 For those whose favorite wine is beer, there are five rotating local brews poured from taps housed in the side of a wine barrel. Sourcing grapes from three different regions of Cali, they produce vino under three labels: Christopher Cameron, Costa Azul, and their namesake, Solterra, which comes from Latin words for sun and earth (ahh, we see what you did there, Nissan Xterra). 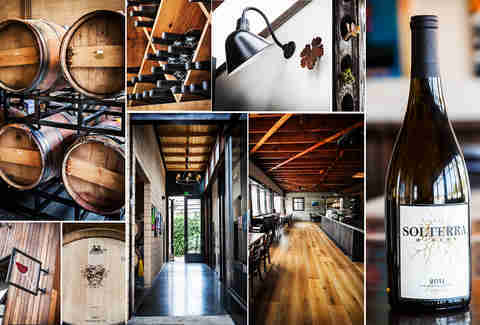 The place itself has a horticultural feel with wine-themed details incorporated into the open-air wood, stone, and metal design, like the 11 varieties of bronze grape leaves lining the roof. 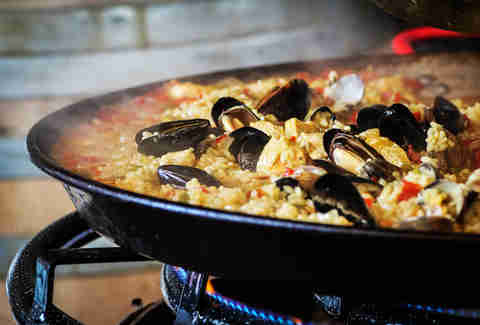 There will ultimately be a menu of small plates, but right now they're rocking a tapas buffet highlighted by this enormous paella full of chicken, Spanish chorizo, mussels, and calamari, which you can watch chef Morgan Bunnell prepare in the barrel room with a giant burner set on top of a wine barrel (wait, aren't barrels made of wood...?). 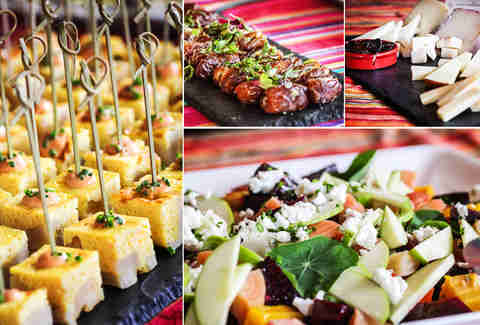 … or non-meat options like a potato fritatta, stuffed dates, heirloom beet salad with granny smith apples and a tarragon vinaigrette, and an assortment of cheeses like Iberico, Manchego, and drunken goat, which is goat cheese soaked in wine -- not a form of cruelty to farm animals.